The products and the salon tour. Last week I had the privilege of attending yet another blogger meet in Bangalore, this time organized by the wonderful people of Blogadda. 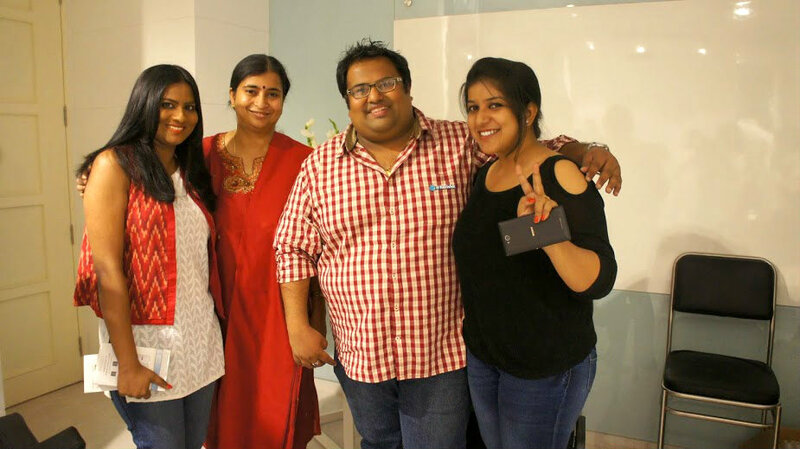 This was my first ever Blogadda meet and I was super duper excited. First, because the people of Blogadda are so awesome. And second, because the event was for a hair product. If you know me even one percent you will know how obsessed I am with my hair. 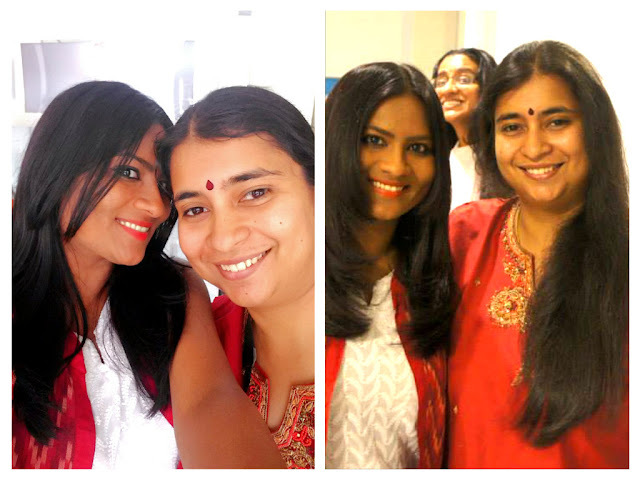 Third, I was getting to meet my favorite blogger Shailaja again. Since the event was at 12.30 pm, Shailaja and I decided to meet up early for a brunch and then attend the event. We had a wonderful time chatting and discussed a lot of bloggers and their work. 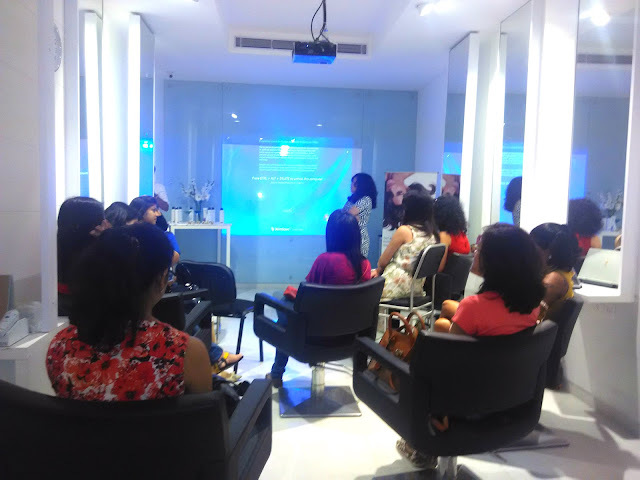 After the brunch we arrived at the Bodycraft salon in Koramangala and met a lot of other wonderful bloggers. A total of twelve bloggers were invited for the event. 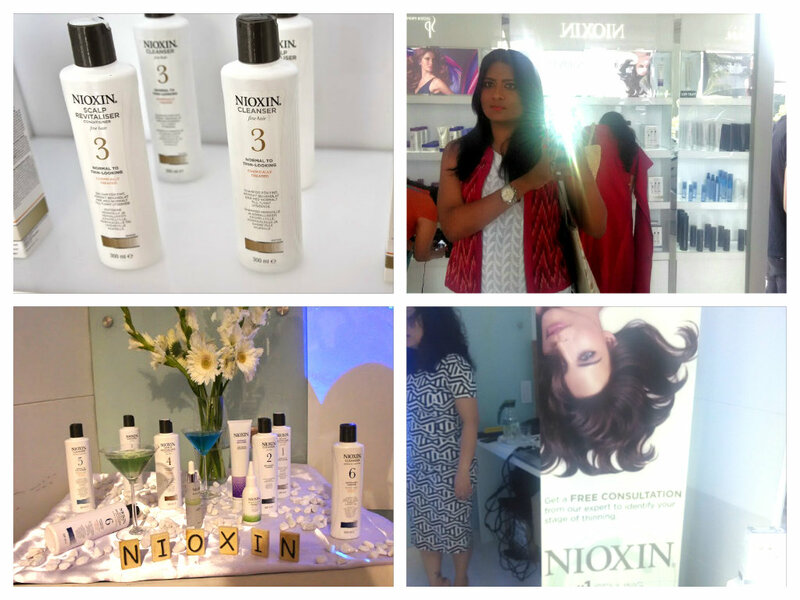 Now coming to event; the event was the launch of the hair care product Nioxin in India. We were first given a tour of the salon, which was newly constructed and just finished. The place was huge and beautifully done up. I love any place that has mirrors and this one was way too amazing. There was a separate section for the Nioxin treatment alone and the place smelt all fresh and dreamy. We were taken to a room where the team of Nioxin led by Daisy were ready for a presentation. 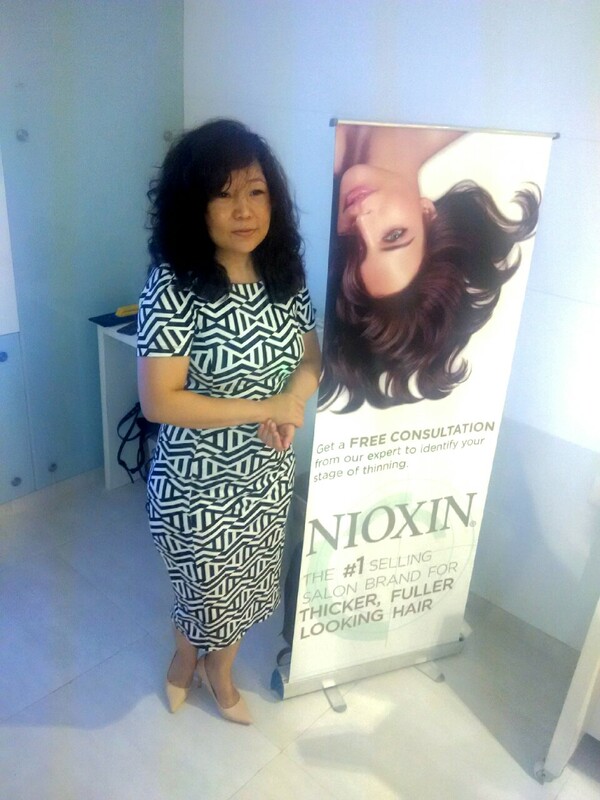 Nioxin is a hair care system just for thinning hair. I have really thick hair and I was not too sure what I was doing there at first. Daisy started off the presentation and explained everything about the product. It was started by Eva Graham, when she noticed that her hair was thinning after her pregnancy. 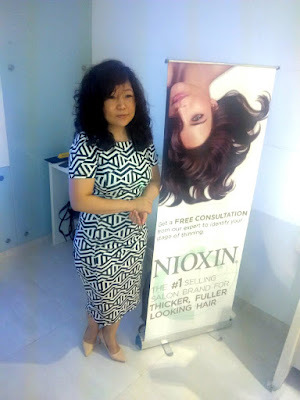 Nioxin is one of the best hair treatments in the US and now it is available in India as well. The presentation went on for a bit too longer than expected, but by the end of it all of us were aware of what this product is intended for. Before and halfway through the after of the treatment. Next, began the one-on-one consultation with the hair experts. I answered all the questions that the expert asked me and I mentioned my concerns as well. I told him that I had thick hair and did not face any problem with thinning. And boy, how wrong was I. When he held a hair analysing device against my scalp, I could see my hair follicles and the hair coming out of them. Although this vision was creepy and extremely disturbing, I could see that there was more than one hair coming out from each follicle and only one of it was thick. The others were really thin. The expert explained to me that there are two types of thinning. One, noticeably thin hair where the scalp is almost visible. Two, normal thinning hair like the one I had. He also showed me that I had an oily scalp, with dead cells on it. Yes, I told you that the visual was disturbing. Nioxin has six types of treatments. From number one to six. After my analysis it was established that I needed the care of system five. He began the treatment with a scalp facial. Yes, I was surprised when I heard that too. He applied some serum like thing all over my scalp by parting my hair skillfully. I sat for ten minutes and then he washed it with the Nioxin system. First, it was a cleanser to neatly wash my hair. Followed by a revitaliser or a conditioner. Next, was the treatment serum that would enrich the roots and help combat thinning of the hair. Next, my hair was blow dried and styled. I felt so light and fresh after the process. Nioxin is not available over the counter and you can get this treatment done only at Bodycraft, Bangalore. 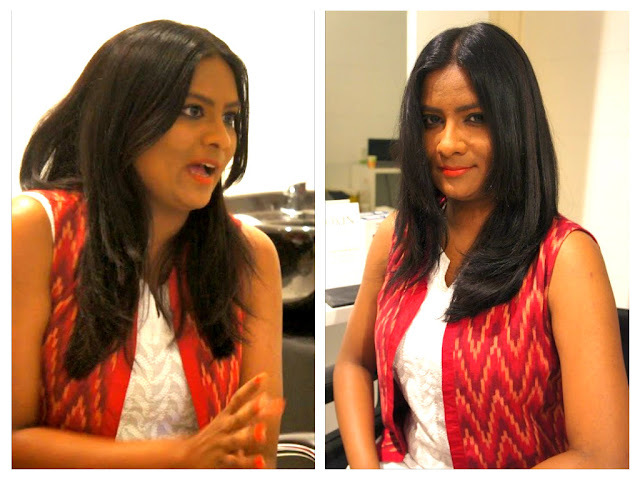 Priced at over 3500 per treatment (it can vary depending upon the length of your hair), it is surely worth it. Shailaja and I with Harish and Ankita from the Blogadda team. The event was a big success and I got to meet so many new bloggers. I met Vidya again who is such a delight with a wonderful sense of humor. Manasa, Rumana, Krupa, Priyanjana, Madhumita, Knitha were some of the other beautiful bloggers that I met. That is the wonderful thing about blogging you know. You get to meet such wonderful fellow bloggers and develop a friendship with them. We all were given our Nioxin kits to use for the next twenty days and write about our experience. I started using the products today and soon you will hear more about it. You can try and experience #NioxinNowIndia at your nearest salon. This activity is in association with BlogAdda.com. Nice post Soumya! ........And nice meeting you dear!!!!! Hey soumya:) Nice to know you had a great time. About your hair obsession? i have read a lot on your blogs :) Will connect soon with you for some more help my dear mentor. Ah! lovely! Your hair sure looks pampered and you both look so pretty!